Microwave or you can dry roast cumin seed, whole corriander seed, cardamom, cloves, black pepper, nutmeg (jaifol), mace ( joyetree/javetri) together. Then crush them into a very fine powder. 3.whole garam masala like 2 pods of cardamom ( elachi) , one small cinammon stick and 2 bay leaf. 1. Wash the chicken pieces and marinate them with ginger juice from 1 tbl spoon of ginger paste , salt and food color (optional, you can alwayz omit the food color) for at least 1 hour. You can include potato in your Morog polau. In that case cut the potatos and rub with little food color and salt. 2. heat oil and fry the potatoes and keep aside. Fry the chicken pieces for a while. Add the whole garam masala. 3. Beat yogurt and combine other ingredients except milk and sugar. 4. Add into the chicken and cook adding water little by little. 4. Add water and cook the chicken. When the gravy is reducing add the potatoes. The potatoes should be half done at the end of the cooking. Otherwise after adding it into polau over cooking may break the potato pieces.The same is with the chicken pieces. So you should add that amount of water so that your chicken is done but still remains firm. When the gravy is almost dried out add one fouth cup of milk and 1 teaspoon of sugar. The gravy should be almost dried out. Only a little gravy should remain. 5. In another vessel add oil+ ghee.Put whole garam masala and fry for a while. Add the sliced onion. Fry them until golden brown. Add the ginger paste and salt..Add rice (soaked and drained out)..Fry for a while. 6. Now add the chicken, potatos into it with the little remaining gravy. Add hot water. If you take 3 cups of rice add 4 and half cups of water. For each cup of rice 1 and half cup of hot water. 7 Cook the rice on medium low flame. Don’t stir your polau after adding the water.That would make your polau gooey and sticky.The water will be almost dried out within 15 minutes. You may think, your pulao looks half done. Don’t worry when we are going to place it on “dom” ( cooking on very low heat), it will be fully done. 8. Add handful of green chilies. Remember the taste of biriyani alwayz depends on the amount of green chilies added in it. they enhances the taste. Since you are adding whole green chilies it won’t make your polau that hot.You may stir your polau now with a very light hand not breaking the rice so that it sould not get burnt at the bottom. 9. Now Cook the polau on medium low heat that we call to keep it on dom. I alwayz use “bain marie” or double boiler system, that works excellent for me. Put your polau vessel over another same size vessel, filled with water. Place it on heat. The steam will make your poalu so moist free. when done spread some ghee over your Chicken biriyani, it would enhance the flavor. Sprinkle some keora water. 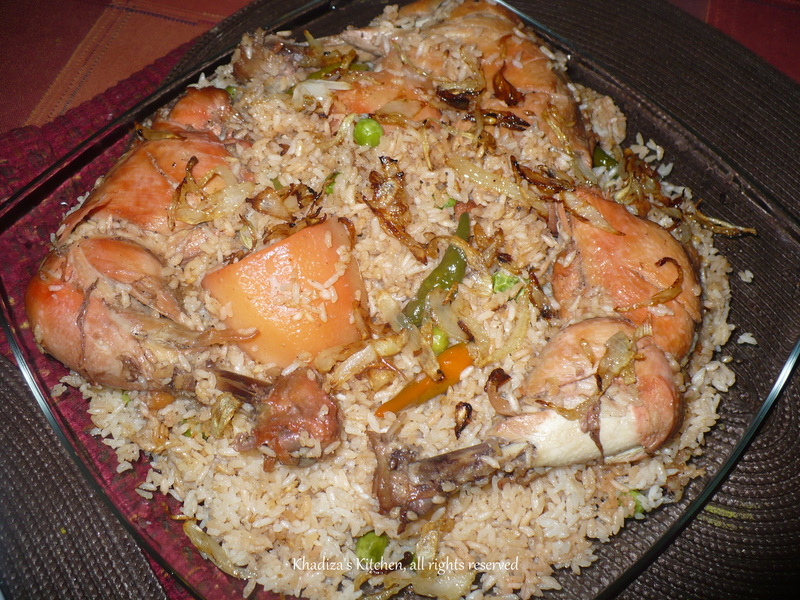 Your Morog Polau/ Chicken biriyani is ready. Serve hot with kabab and salad. This entry was posted in Biriyani, Pulao, Rice and Grains and tagged bANGLADESHI fOOD, Biriyani, Chicken, chicken birani, Chicken Biriyani, Chicken Polau, chicken pulao, iNDIAN fOOD, Morog Polau, Morog pulao, Murog pulau, pilaf, Polau, South aSIAN fOOD. Bookmark the permalink. Apu i have made the chicken polau following ur recipe and it turned out so good..just a question to ask, the ginger paste is 2 T+1 t? Because in ur recipe, its written 2 T+1T. Apu aami jodi basmoti rice cook korte chai tahole cold water er porimanta ektu janaben pls.aami chaler(pran chinigura) double cold water use kori. thank u so much.. and sorry for the late reply .. for the chicken , u need 2 tbl spoon of ginger while making the gravy and the juice from 1 tbl spoon ginger to fry them in oil before putting them in gravy ..
can u plz tell us the measurement of special garam masala’s ingredients. Hi!, My mother have been very passionate about your recipes and have been following all your cooking process very neatly. She just faced a confusion in the cooking process of ‘chicken biryani’. Would you please specifically mention the measurements of ‘Special gra masala’s ingredients’ and ‘oil+ghee’? It would be very helpful. Thank u so much .. well the quantity of oil and ghee depends on the utensil u r using. But for chicken , u may need Half cup or little more than half cup oil .. and for rice , 1/4 th cup ghee and 1/8 th cup oil .. or u may cook the rice solely on ghee ..
For the special garam masala powder grind 4/5 cloves, half a teaspoon black pepper, half a teaspoon cumin seeds, half a teaspoon whole coriander, 3 cardamoms, little amount of joyetree/ mace together..
i try it but sometime my all rice was not boiled . can you tell me why? I made this pulao & exactly followed your method of boiling rice & giving dum. But for dum I covered the container with a kitchen towel then put the lid on it. Turned out to be an instant hit. Thanks so much & keep on posting such wonderful recipes. Have youu ever thought about adding a little bit more than jus your articles? Your contet is excellent but with images and videos, this blog could definitely be one of the most beneficial in its field. yyour RSS. I don’t understand the reason why I am unable to join it. Do you add the cardamom seeds or the whole cardamom when you’re crushing the spices together? Dear Khadiza Haque, I really liked how you describe each and every step and even some li’ll secrets from your sleeve. So far I have made 2 dishes and both of them turned out so good. Thank you so much for this page. Do you live in North America? Just to let you know that I love your recipes( tried 4 of them and they were really good),no one describes their recipes as clearly as yours, thank you very much for your hard work and sharing the recipes with everyone!!!! Hallo, Video ase ei recepi er jonno ?